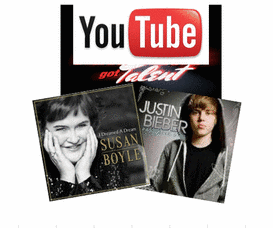 Ever Since Susan Boyle became an international break-out star, and Justin Bieber ignited a full blown career as a result of his videos going viral, YouTube's capacity to create overnight sensations has become a proven fact. Today it was announced, NBC and the producers of "America's Got Talent" are partnering with YouTube to put the show's audition process online. In an unprecedented network first, YouTube has revealed that America's Got Talent is looking for its next big star via the online platform and a special AGT/YouTube performance show will be aired on NBC, August 10. Twelve acts will be selected to perform live on the show, one of which will be selected by YouTube voters. 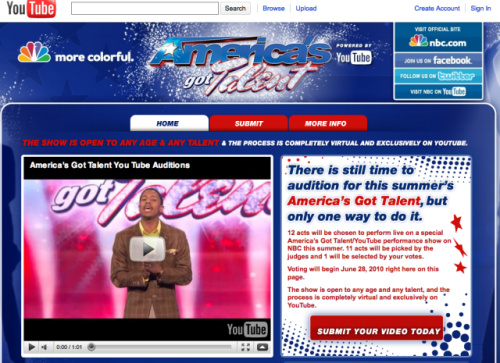 June 23 is the deadline for those interested in applying and a 90-second video entry via AGT's YouTube channel is required. After that, the public's vote will be begin on June 28 and the Grand Prize Winner will be notified no later than August 11. Contestants of any age with any talent are eligible. The Web site promo appeals to those with traditional talent in addition to some of the more bizarre acts the show has become to be known for. Sure we need singers, musicians, and dancers, but we also need variety performers like animal acts, jugglers, magicians, comedians, and performance artists. However weird, unique or wonderful your act, if you think you are talented, we want to see you! This is a once-in-a-lifetime opportunity that could change your life forever! A Twitter profile was just registered under the handle @YTGotTalent, but as of this posting only has 67 followers. Be interesting to see how this account scales over the coming weeks leading up to Grand Prize award date. So if you're now convinced that YouTube can make you a star - I suggest you pull out that Web cam and start showing us your stuff. 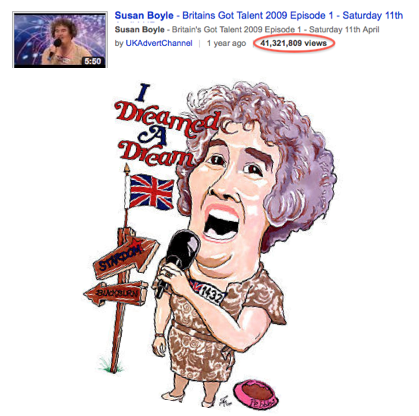 At last count, Susan Boyle's Britain's Got Talent YouTube video was able to rack up over 41 million views. You can't get any more viral than that. Well, you can... but that takes talent!